North Fambridge is on the north bank of the River Crouch opposite South Fambridge and is served by North Fambridge railway station on the Crouch Valley Line. Administratively, North Fambridge forms part of the ward of Purleigh in the district of Maldon. Adjoining the village is Blue House Farm, a 605-acre (2.45 km2) Site of Special Scientific Interest and nature reserve owned by the Essex Wildlife Trust. In the Domesday Book, North Fambridge was known as 'Fanbruge'. North Fambridge is home to the Fambridge Yacht Haven Middle Distance Triathlon. The first event took place on 24 July 2011 and was the first Half Ironman Triathlon in Essex and the wider region. The local public house is The Ferry Boat Inn. The North Fambridge Yacht Club is based in the village. Holy Trinity Church has been serving the community for at least 200 years. ^ "Civil Parish population 2011". Retrieved 22 September 2015. 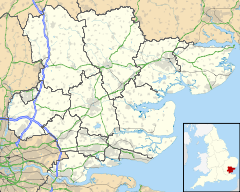 ^ "North Fambridge at Maldon District Council". Retrieved 2008-11-23. ^ "Blue House Farm at the Essex Wildlife Trust". Retrieved 2008-11-23. ^ "Fambridge Yacht Haven Middle Distance Triathlon". Retrieved 2011-08-11. ^ "Crouch Valley Churches: Holy Trinity, North Fambridge". Retrieved 2011-05-07. Wikimedia Commons has media related to North Fambridge. This page was last edited on 1 March 2018, at 23:26 (UTC).